Note: This guide was written using Windows 10.0.14393. Click on Downloads on the left side of the pop-up pane. Then, double-click on SetupStata15.exe to install. Click Next again to complete the installation. If you have difficulty modifying your installation, you may wish to try uninstalling your existing license first. Once installation is complete, click on the Start button. Find the STATA.LIC file. (Depending on your preferences, the .LIC extension might be hidden.) Right-click and choose Delete. 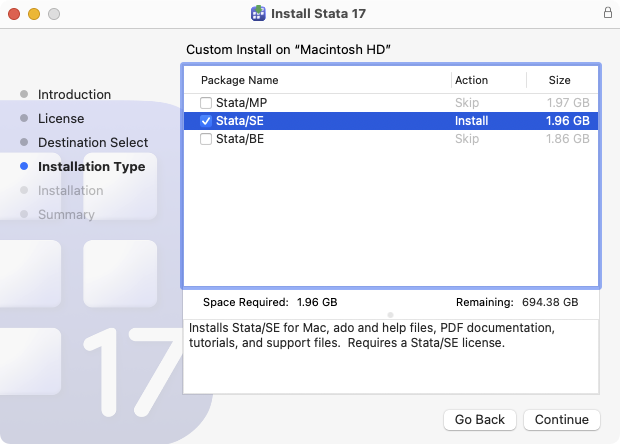 Double-click on the Stata application (inside the same folder) to start a new session of Stata. This will open a dialog box that prompts you for your new License and Activation Key. You must enter something for all fields in the dialog before you can continue. You must enter five or more characters in each of the Name and Organization fields. We recommend copying and pasting your Serial Number, Code, and Authorization. to make sure you have the latest updates installed. Follow any instructions presented on the screen. 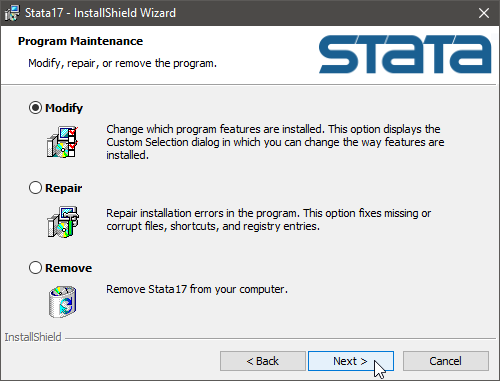 First you will need to uninstall your current copy of Stata. To do this, click on Finder in the Dock. 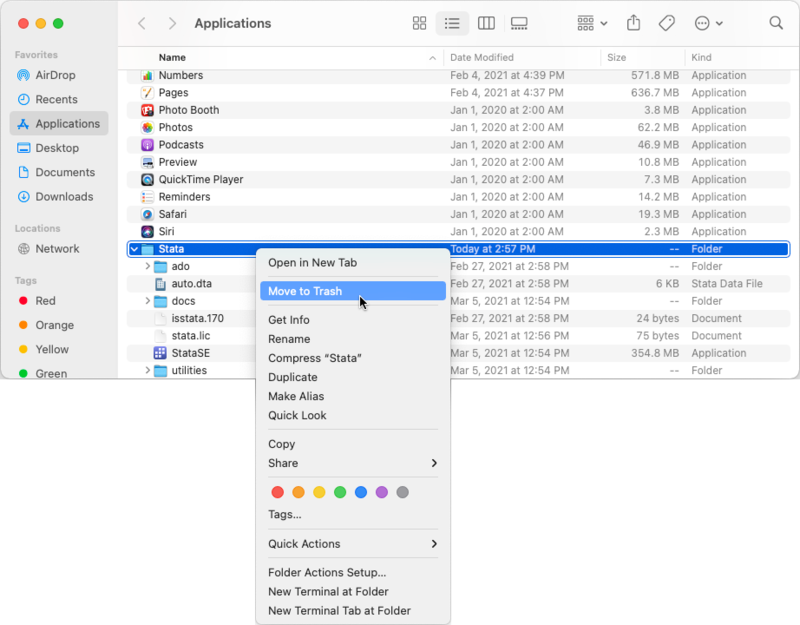 Click on Applications in the left-hand pane. This will list everything in your Applications directory in the right-hand pane in alphabetical order. 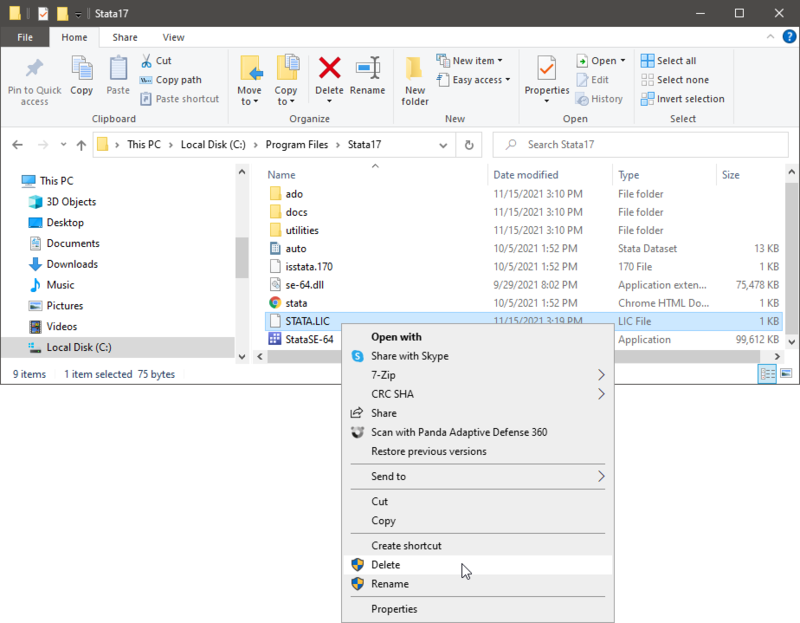 Right-click on the Stata folder, and choose Move to Trash from the pop-up menu. 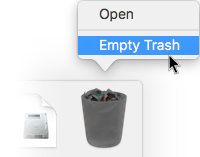 On the Dock, right-click on the Trash icon, and select Empty Trash. Now you are ready to install your new flavor of Stata. Click on Finder in the Dock. In the search field, enter Stata15.dmg. 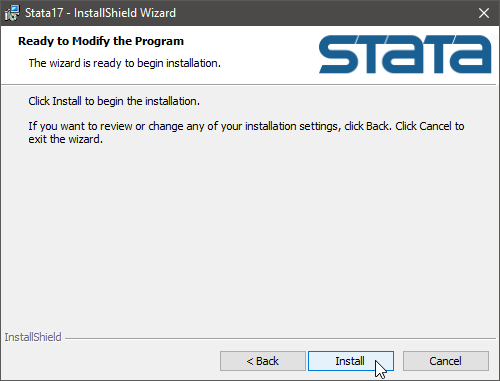 Start the installer by double-clicking on Stata15.dmg. 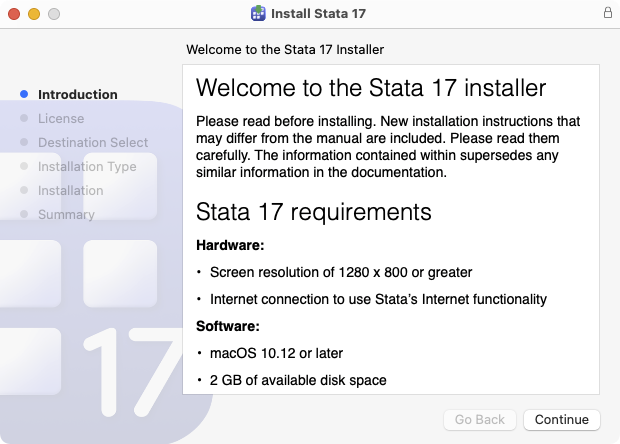 Check the flavor of Stata you are upgrading to. Confirm the flavor you check matches the flavor on your License and Activation Key. Click on Continue. 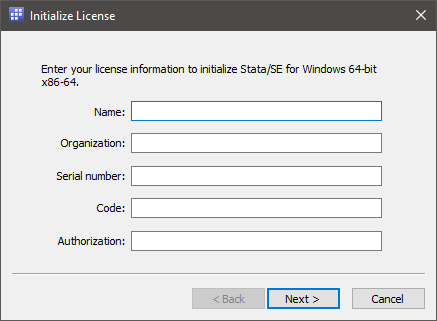 During installation of the new flavor, Stata's license file, stata.lic, will be automatically renamed stata.lic.old. Next, launch the new flavor of Stata. To do this, click on Finder in the Dock. Click on Applications in the left-hand pane. This will list everything in your Applications directory in the right-hand pane in alphabetical order. Double-click on the Stata folder, and then double-click on the Stata application. 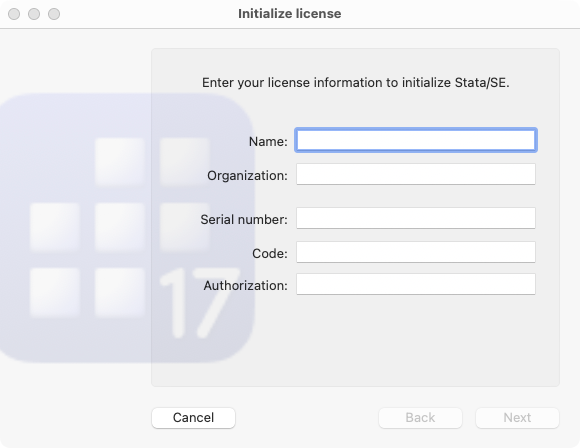 Stata will launch a dialog box prompting you for your new License and Activation Key. 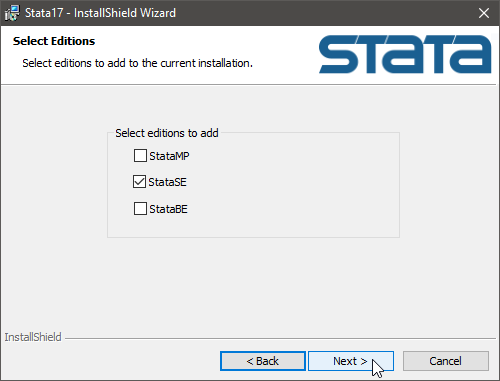 All flavors of Stata were already installed when you first installed Stata. You merely need to re-initialize Stata's license and then start using the new flavor. If you have any difficulty with the installation process, contact technical support.